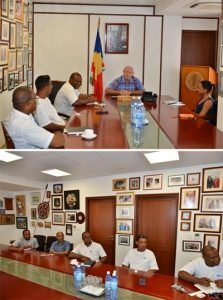 In a meeting held on Monday, the Minister for Tourism and Culture, Alain St.Ange met with the Chairman of the Seychelles’ Association of Omnibus Operators (SAO), Mr. Mervin Elizabeth together with other members of the association to follow up on the progress of the association ever since its creation as well as to address challenges they face. The Chairperson of the Association expressed the need for omnibus operators to be more visible on the tourism platform and be more involved in national events. Minister St.Ange welcomed the proposal and recommended that the Creative Industries and National Events Agency (CINEA), the newly formed agency responsible for organizing all national events, will be asked to be actively involved with the association and channel any omnibus related services through the association. In order to further assist in becoming more visible, the association will be featured in the next edition of the magazine “Inside Seychelles” tourism newspaper and on the Seychelles Tourism Board’s website. The Minister also reassured members that a follow up meeting will be held this week with the CEO of Seychelles Tourism Board and her team to ensure that they are on board. Throughout the discussion, it was pointed out that many pertinent issues raised were relevant to the entire tourism industry. In the meeting it was therefore proposed that a federation consisting of representatives from all associations involved in the tourism industry be formed to address any interrelating issues. An initial meeting with all the associations will therefore be held in October 2016 to create the right platform to address any concern with the aim of working collectively to increase the tourism yield.